The two definitions incorporate more-precise measurements than are likely to have been applied back in 1845, when MW says the term was first used in print, and this suggests to me that there may have been a significantly simpler definition (such as "small birdshot") back in the earliest days of the word's use. Also, the 1845 origin date notwithstanding, the first edition of the Collegiate Dictionary to include any entry for BB was the Eighth Collegiate, published in 1973. This doesn't strike me as being very informative. The Compact Edition of the Oxford English Dictionary (1971)—the edition with the magnifying glass—has no entry for BB at all. The Online Etymology Dictionary doesn't cover the term either. The term "BB" originated from the nomenclature of the size of steel balls used in a shotgun. BB sized shot was normally 0.180 inches (4.6 mm), but tended to vary considerably in size due to the high tolerances in shotgun shells. The highest size shotgun pellet commonly used was named "OO" or "double ought" and was used for hunting deer and thus called "buckshot." Around 1900, Daisy, one of the earliest makers of BB guns, changed their BB gun bore diameter to 0.175 inches (4.4 mm), and began to market precision-made lead shot specifically for their BB guns. They called these "round shots", but the "BB" name was already well established, and everyone continued calling the guns "BB guns" and the shot "BB shot" or just "BBs". This discussion corroborates the Eleventh Collegiate's measurements for pellet diameter, and it suggests a first occurrence date for definition 2 of BB of "around 1900," when Daisy standardized the size of the lead pellets for its BB guns at 0.175 inch in diameter. But it doesn't address the origin of "BB" as a classification name, including whether it originally stood for some longer word or words, nor does it indicate whether BB is older or younger than such other birdshot classifications as FF and TT. The "Shot" subsection of Wikipedia's entry for "Shotgun" notes that current U.S. standard birdshot sizes include (from largest to smallest) FF, F, TT, T, BBB, BB, B, and 1 through 9. It doesn't offer any insight into how, where, or when these classification names originated. Neither does the "Birdshot" subsection of the Wikipedia entry for "Shotgun shell". What (if anything) does BB stand for? What was the source and original meaning of the term? When and where did it first appear in written English? Question 1. The initialism 'BB' stands for 'bulleted breech' (also found in the form 'bullet breech'). The .22 BB (Bulleted Breech) cap appeared in 1845 for the Flobert parlor rifle. 1845 H. W. Herbert Warwick Woodlands 165 Van Dyne..was just in the act of pouring a double handful of BB into his Queen Ann's musket. Question 3. My research did not reveal any pertinent use of the initialism earlier than the 1845 OED quote reproduced in full above. In light of the date other sources give for the invention of the BB round by Flobert, it's unlikely that earlier written instances exist. I did run across one source, the Bulletin of the Oklahoma Anthropological Society (Volume 45 Oklahoma Anthropological Society, 1996) that dated the BB load to 1831. Given the complete absence of support for that date, my assumption is that the 1831 date is a simple factual error. 1) BB may stand for "Buck Buck", but more likely, nothing at all. This is based on standardized shot sized tables of the era that list BB as being the next largest size to 0, 00, and 000 shot (shot sizes designated with a zero are referred to as 'buck shot') that doesn't bear a number designation. Numbered shot over .2" diameter are now archaic and, aside from the 'ought' shots, numbers are used for the smaller shot sizes, the diameter decreasing as the number rises. 2) The source of the name is almost certainly industry tables designed to standardize shot by diameter, number per ounce, and to apply an agreed name to the particular sizes of shot. 3) The earliest that I can find any evidence of it used as a standardized term is 1888 (unless we accept Tom Gaylord's assertion below of it's common use in 1886). This is on page 155 of William Wellington Greener's Modern Shot Guns. This also includes the tables that apply to 2) and 1). Additionally Edward Henry Knight's American Mechanical Dictionary, Volume 3, A Description of Tools, Instruments, etc...' (1876) lists a similar table on page 2166. The first BBs were actual shotgun shot, sized BB. They are nominally sized 0.180 inches in diameter. The airgun projectile we call a BB began in 1886 as common lead shotgun shot, sized BB or 0.180-inch diameter. It was selected for W.F. Markham's revolutionary new spring-piston gun that was made of maple wood and a minimum of metal parts. The probable inventor of the new airgun, George W. Sage, simply chose a commonly available projectile that produced good results in his creation. One year later, Clarence Hamilton of .22 rimfire fame followed Markham by inventing an all-metal spring-piston airgun. When he demonstrated it to local businessman and founder of the Plymouth Iron Windmill Company, Lewis Cass Hough, the surprised man declared, in the vernacular of the day, 'Boy, that's a daisy! Hamilton's clever little gun was also made to shoot lead BB shot, and Hough thought enough of it that he commissioned several hundred to be built for premiums when farmers bought his iron windmills. Production began in 1888. Demand for the new airgun quickly outstripped windmill sales, and Plymouth Iron Windmill began making the BB guns to sell directly. They used Hough's original exclamation as the trade name. In 1895 the windmill company reincorporated as the Daisy Manufacturing Company and continues under that name today. In order therefore, to shew clearly, at one view, the comparative difference in the garnishing of [patent] shot of different sizes, we here subjoin in a table, which indicates the number of pellets precisely composing an ounce weight of each sort of shot. So already in 1792, at least one hunting guide in England was identifying distinct categories of shot size on the basis of how many pellets of that size weighed an ounce. And already there existed the unexpectedly heterogeneous system of identifying shot size from larger to smaller running from 1 through 8, and then identifying shot sizes larger than No. 1 as No. B and No. B. B. The Reader will observe, that the patent shot has no No. 6, the X being substituted in its place, and that the numbers do not follow each other in the order of progression: the reason of this we cannot assign. The strangeness of this schedule is twofold. First, it inexplicably replaces the number 6 with an X. And second, it reverses direction partway through the chart, listing No.s 8, 7, and X (6) in order of increasing pellet size, but then assigning No.s 5, 4, 3, 2, and 1 in the opposite order by decreasing pellet size. It’s as though someone had started a countdown from 8 toward 0 but then suddenly replaced that system with a countup from 1 to 5. The sizes of common shot for fowling are from No 1 to 6, and smaller, which is called mustard seed, or dust shot; but No 5 is small enough for any shooting whatsoever. The No 1 may be used for wild geese ; the No 2 for ducks, widgeons, and other water fowl ; the No 3 for pheasants, partridges after the first month, and all the fen fowl ; the No 4 for partridges, woodcocks, &c. ; and the No 5 for all the smaller birds. Earlier discussions of shot used for fowling had described how to make the shot, but they had not mentioned the use of a classification system of numbered sizes of shot to identify the different sizes of pellets that may be produced. In a table reporting numbers for both common shot and patent shot, William Nicholson, The British Encyclopedia or Dictionary of the Arts (1809) mentions shot sizes No. 1 through No. 10 in the course of describing appropriate shot to use for different birds, but he devotes most of his attention to No.s 4 through 7, which he says are best for fowling. There is no mention here of categories with letters rather than numbers, but to his credit Nicholson abandons the Marolles schedule in favor of a consistent sizing scheme. B. Thomas, The Shooter's Guide, or, Sportsman's Companion (1811) presents a schedule of eleven categories, consisting of sizes B.B., B., and 1 through 9. Thomas proudly reports that he personally counted the number of pellets in an ounce of each type of shot, the numbers ranging from 58 pellets for B. B. to 970 pellets for No. 9; however, he doesn’t discuss a suitable target for B. B. shot, though shot of that grade appears to be too large for the bird hunting that he is chiefly interested in. The shot of different manufacturers varies much in size : for example, an ounce of No. 7, from Messrs. Walker and Maltby, amounts to 341 pellets ; and the same weight, from Mr. Beaumont (late Preston), 398 ditto, &c.: and, in some places, the numbers are reversed. This last comment seems to harken back to the confusion surrounding Marolles’s schedule from 1789. According to labelled samples, which were sent me from Messrs. Walker, Maltby, and Co., Patent Shot Tower, Lambeth. The firm is now Messrs. Walker, Parker, and Co., as Mr. Maltby is established in the shot-business by himself, at the new round tower on the other side of the bridge. and so on through 10 at 1726 pellets per ounce. The various sizes of the shot are distinguished by the manufacturers by the Nos. 1 to 12; the largest, No. 1, are called Swan shot; the smallest, No. 12, dust shot; their diameter varying from 1-30th to 1-4th of an inch. It isn’t clear, however, whether Herbert is saying that the 1–12 system was the one in force in 1782, when Watt obtained his patent for shot-tower shot, or whether he is claiming that that system is the one in force in 1831 (which it evidently is not—at least not in Lambeth, England, at the shot works of Parker & Maltby). Yet another early mention from England appears in Captain Lacy, The Modern Shooter (1846), who likewise identifies a schedule of “patent drop-shot” offered by Walker & Parker in Lambeth, England—this time across15 categories ranging in size from about 1,700 pellets per ounce for “No. 10” shot to about 32 pellets per ounce for “A A A” shot. In a table that Lacy provides, drop shot is divided into 15 categories. In order by ascending size of each pellet, the categories are 10 through 1, and then B, B B, A, A A, and A A A. This time, the “B B” category is defined as having a yield of about 60 pellets per ounce of lead. To this point, all of the citations have been to English sources, and we have seen an elaborate classification system emerge with A A A at the large-pellet-size end and 10 at the dust-size end. Off we set without further parley—within five minutes I had bagged Tom’s first, a rare green-headed Drake, and joined Van Dyne, who, with the head and neck of his first bird hanging out of his breeches' pocket, where, in default of game-bag, he had stowed it, was just in the act of pouring a double handful of BB into his Queen Ann's musket. Before he had loaded, we heard a shot across the road, and saw the fifth bird fall to Harry at long distance, while Shot [a dog] was gently mouthing Draw’s second Duck to his unutterable contentment. This is the same article that JEL cites (in another answer) from 1845 in (it appears) a periodical called Warwick Woodlands, but the original version of the article is five years older and from the United States. Notably, Van Dyne is described here as “pouring a double handful of BB”—that is, of BB-size shot—into his Queen Ann’s musket. This is quite a different sense of BB from the “B-B [bulleted-breech]” percussion cap cartridge that JEL notes was invented in 1845 by Louis Flobert. I strongly suspect that the naming similarity between “BB shot” and “B-B [bulleted-breech] cap” is purely coincidental. Edward Knight, American Mechanical Dictionary, volume 3, A Description of Tools, Instruments, ... (1876) compares drop shot sizes and labeling conventions at manufacturers in Baltimore and New York. The Baltimore schedule includes 19 pellet sizes, ranging from largest to smallest through the categories of TTTT, TTT, TT, T, BBB, BB, B, and 1 through 12. The New York schedule has nineteen categories, too: FF, F, TT, T, BBB, BB, B, and 1 through 12. The BB size in Baltimore yields 45 pellets per ounce, while the New York BB size yields 50 pellets per ounce. These yields are significantly but not hugely different from the English BB size yields of 84 years earlier (60 pellets per ounce) and 60 years earlier (58 pellets per ounce). Why is the nomenclature for shot schedules so odd? I am persuaded that the term BB as applied to spherical pellets of lead or other metal began as a size designation for lead shot in England no later than 1792, and migrated across the Atlantic to the United Sates sometime in the first half of the nineteenth century. When you cast your Shot, take them out of the Water, and dry them over the Fire with a gentle Heat, and be sure to keep them continually stirred that they melt not. When they are dry, you are to separate the great Shot from the small, by the help of Sieves made on Purpose according to their several Sizes. Obviously if you are planning to run shot through a series of sieves, you’ll want to use the screen with the largest openings first, to catch the largest pellets and let the smaller ones pass through. And as this is the first screen you use, it is natural to refer to the resulting large shot that it filters out “No. 1 shot.” The same goes for the second screen and the No. 2 shot that it filters out, and so on down the list to the lead dust particles that pass through the finest-mesh screen at No. 8 (or later, No. 10). When companies began attempting to standardize the shot sizes they produced, I imagine that they applied this same simple numbering system to the results of multiple screenings of the shot. But when they began to use larger-mesh screens for the first passes than were used in the original numbered sieving or screening process, the manufacturers found themselves in a bind regarding nomenclature: either they had to renumber all of the shot sizes so that the new No. 1 size shot was now two screen sizes larger than the traditional No. 1shot—and so on for all subsequent shot sizes, or they had to leave the existing shot sizes approximately as they were, and come up with a new naming convention for the larger shot sizes. In any event, the English system combining the numbers and the B and BB extensions (but not the A extension) made the jump to the United States, where the inevitable high-end increases in pellet size acquired different letters from the ones that emerged in England during the later 1800s. The BB owes its preeminence among the shot categories to the emergence in the late 1800s of the BB gun, a single-shot long-barreled gun that fires a BB-size pellet. Although the Daisy company is famous for gaining a huge following for its BB guns, around 1900, and for slightly altering the size of the standardized pellets used in them, less uniform BB guns were already widely used by the early 1890s. This is evident from the earliest match that a Google Books search finds for the term “BB gun”: it’s from a comment in American Law Review (July–August 1892 )discussing state court rulings that a parent who gives a child of nine, ten, or eleven a BB gun and the child or a friend of the child later puts out someone's eye with it is not guilty of negligence for having entrusted the gun to the child. I haven’t been able to find a history of shot nomenclature that spells out precisely how the parallel systems evolved in England and the United States, but it appears that the earliest schedules of differentiated sizes of shot (from the late 1700s) began with an all-numerical system based on the order of the sieves or screens used to filter out pellets of roughly equal size, starting, for obvious reasons, with wide mesh sizes and growing progressively finer. The BB specification appears to have been a later edition (from the early 1800s) that arose when shot makers introduced new screens at the upper end of the process but chose not to renumber the existing screens and screen-based shot sizes. This led to the use of letters for the next-larger sizes, starting with B, and BB. The English shot schedules arrived in the United States after the B and BB sizes had been added to the basic numbering system but before the still-larger A, AA, and AAA sizes came into use. From that point onward the English and U.S. systems went their separate ways, and in the U.S. sources I consulted there is no indication that A, AA, and AAA were ever adopted, the larger sizes being instead assigned to T, TT, F, FF, etc. 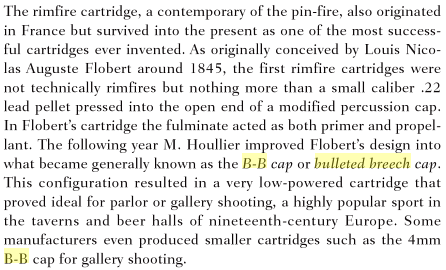 A final complication worth noting is the emergence of so-called “B-B [bulleted-breech]” percussion cap cartridge in the United States in the mid-1800s. These cartridges seem to me to be etymologically unrelated to BB shot. Not the answer you're looking for? Browse other questions tagged etymology origin-unknown initialisms or ask your own question. When and from where did “guns” become slang for biceps? In what context did the noun 'countdown' first emerge, and when did the word first appear in print? What's the source of “shipped” in a romantic sense?